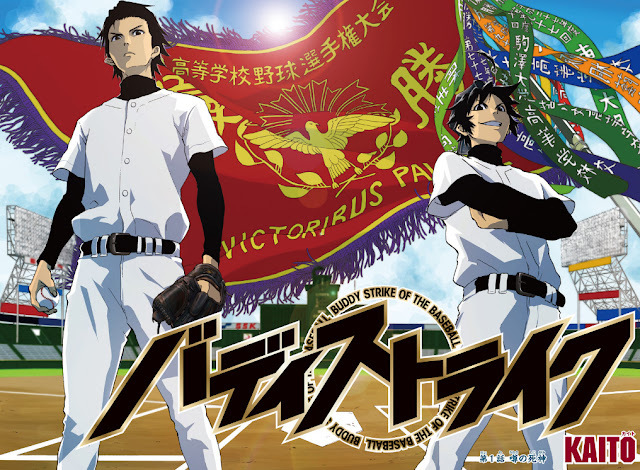 "A pitcher who has difficulty controlling his pitches, Ryo Arakami, one day meets the catcher rumored as the ""Grim Reaper that devours pitcher's souls"". Can the two become the world's best battery? Find out in Kaito's baseball series. Buddy Strike began in Weekly Shonen Jump #51 by the author of Cross Manage, Kaito. Cross Manage was also a sports series, which focused on Lacrosse. It was cancelled shortly afterwards. Kaito will have to pull out all the stops if he wants his new series to avoid the same fate as its predecessor. The overall lot seems very generic, in that its been used many times before. Daiya no Ace from Weekly Shone Magazine has a similar premise. However Buddy Strike has a different tone, setting and pace that other incarnations don't have. The artwork and story development is more rough and shonen. Thus it should definitely appeal to the Jump readers, more so that Kaito's other series.